Chef's Notebook: "La Chandeleur" or Crêpe Day! "La Chandeleur" or Crêpe Day! 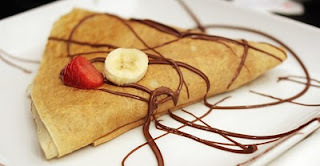 Today is Crêpe day in France! Or as they call it "La Chandeleur". In France, the second day of February is a religious day and celebrated like Candlemas. La Chandeleur is also the day for predicting the future similar to Groundhog Day in the United States. However, it is not a furry critter that foresees your fortune - it's a crêpe! First, using only one hand holding onto the pan, attempt to flip the crêpe onto it's second side after it has cooked on the first side. Legend has it that you will enjoy good luck for the rest of the year if the crêpe lands perfectly in the pan. Suffer bad luck if the crêpe does not land well - or you can do what I do...try again! Now try making your own. Place the milk and one cup flour in a blender, blend on low or stir. When the flour is mixed, add the second cup followed by the eggs, one at a time. Add the melted butter salt and the sugar then the vanilla. Leave mixture for at least an hour.This gives the flour a chance to "bloom" and create the needed gluten which will hold the crepe together while cooking. Put half a ladle, or 1/4 cup, of crêpe mixture into the pan, swirl to evenly distrubute and cook for 2 minutes on first side then flip and cook additional 1 min. Suggested accompaniments: sugar, Nutella, jam, honey, fruit or fillied with stawberries and whip cream!